If you were going to read just one more article about Bible-study methods . . . This one. You should read this one. 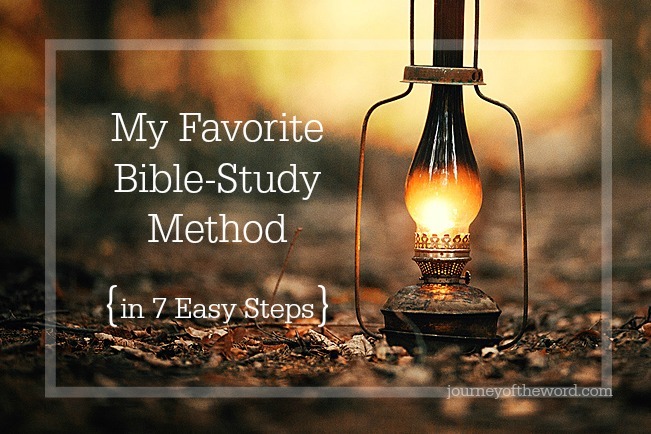 This Bible-study method changed my life. And maybe, just maybe, this Bible-study method is the one for you. At least until your personal study is complete. It’s all about discovering the Bible for yourself. Preferably an entire book of the Bible. If it’s more than 10 chapters, divide it into chunks of 5-7 chapters. Friends who are just as eager to know what the Bible says. ask “dumb questions,” and allow you to ask yours. There are plenty of Christians who would love to do this. Even just one will do. I suggest 12-16 weeks per book or chunk of chapters. Better to know a small portion than to skim the whole. Spend one or two days of “quiet time” here. Read the entirety of the passage, and read it slowly. Use colored pencils to track words/themes. Make note of anything that comes to mind, no matter how trivial. Track what you want to discuss with someone. Take turns sharing what you’ve been discovering in your personal study time. You may not ever find the answer. Just ask the question. And sometimes the most profound reveals itself in the most simplistic. Light bulbs are everywhere at this point. Tell your friend about them. And now. Now that you’ve had two months to consider the meaning of the passage . . . Finally, and only finally, we take steps toward application. What about this passage strikes you and convicts you personally? How do you want to see God use it in your life? When you’ve completed all 66 books, start over. Because it continually opens my eyes to the Word in a way nothing else does. Because anyone can do it. Because it’s manageable, effective, powerful, and loads of fun. To date, I’ve studied 12 books using this method. Looking to join me in the journey? If you decide to try out my favorite Bible-study method, I’d love to hear about it! And I’d love to hear your own Bible-study goals and tips! What steps are you taking to know the Word and to see it at work in your life? These sound like some very good suggestions as they encourage you to take some time in each passage rather than just skimming over. I probably would spend a little less time than 12-16 weeks unless I just found myself immersed in it not wanting to stop. Blessings to you! I’m your neighbor at #WordOfGodSpeak. I usually find that 12-16 weeks is not nearly enough time! There’s so much to do with a passage! Good steps/tips, thank you…but don’t skip reading through the Bible in a year! It takes only 15 minutes a day. Do it in addition to this study! Yes, I’ve considered that. The difficulty for me is that I’m so incredibly lost in passages that I haven’t studied in-depth. So, I feel that my time (even those 15 minutes) is better spent studying passages in-depth. But, I agree, it is important to be reviewing the whole of Scripture on a regular basis. Thanks for the reminder! I have found that in the long run it helps me tie ‘the whole’ together. BUT we should not get so hung up on ‘having to do this & that and not this and that’ that we paralyze ourselves….and that is a very good point you make in this blog post. Blessings! Though I am not a Christian, loved your post very much. Very useful list. Thank you for stopping by and hope you’ll return often! Will have to try this. Thank you! Interesting. Truly. Thanks for sharing. So glad I was your neighbor today. Blessings upon blessings! I’m also learning this discipline of sitting with my questions, letting the Word speak for itself, rather than running to a commentary with every question! I’ve only read psalms and proverbs, and not really in depth. Maybe I should do it again with a set of colour pencils to highlight the bits that resonated with me and I can go back to. I may do that one day. Sounds great – I love taking something and just ruminating on it for awhile, keeping an eye out for unexpected connections between the passage and my own life. I do tend to check in with commentaries from time to time when I hit a question I think they could help clarify (usually involving context). Thanks for linking! Ooh, thanks! I might have to check it out! I think this is a valuable way to study the bible. Thanks for sharing on #LMMLinkup. Oh! Please do! Would you send me the link when it’s posted? Thanks! Sounds like some very good suggestions. God’s Word is powerful and life changing, isn’t it! I’m visiting today from #LMMLinkup. I got some great ideas from this article, thank you for sharing! Good evening from your next door neighbor over at Anita’s! Thank you for sharing what’s working for you as you study God’s Word, Lydia. How our desire to connect with the Lover of our souls must please Him! I know the feeling. It seems like you could never spend that much time in one section. But now that I’ve tried it (with the smallest of books! ), I always feel like I could spend much more than 16 weeks! It’s amazing! And then you feel like you’ve lived in the book and know it so well! I love these tips. I’ve already implemented some, just finished James now onto Ephesians. I like the idea of color coding. I have a journal that I usually watch a sermon on and write notes in. I also like the idea of repetition for the week. I’m awful at memorization but maybe this will help. Thank you for the tips! Great tips. I always try to stay in one or two bible studies that help me stay focused and in tune with the word and with others. I am definitely all about community and asking questions so I want to point out that this was a great point. I like reading over and over again because since it is the Living word, I find something different each and every time depending on the season I’m in. Thank you for linking up to Open Mic Monday for the soul at Cisneros Cafe. Have a blessed rest of your week, Lydia. Your steps are excellent. If you are planning on teaching – it might be good to have a commentary handy, or Halley’s Handbook. For personal study and group study put the commentary aside until later. Thank you for sharing here at Tell me a Story. Well, it depends on what you mean by “teaching,” but I’ve coordinated several group studies, and I always encourage women to try out this same approach – and that means no commentaries! Great Bible study method!! I love how it incorporates personal study time, just you and God, then times of reflection and study with Bible study partners, and I especially like focusing on a series of passages for a period of time, to really get the meat out of it. These are great methods! I write Bible studies that ask questions from the text. When we are finished answering the questions we have studied from front to back an entire book!! At conformingtothetruth we are currently Reading 17 New Testament books in 17 Weeks. We are spending one week reading through a book. I love your ideas. Looks like we have similar ideas of study! God Bless. Glad I stopped by from Sitting Among Friends! Love this! I remember giving up all bible-reading plans and just reading the bible. Just taking my time and going through it. Occasionally I would check a commentary or bible notebook, but it is freeing to go at my own pace and learn new things each time. I’ll be pinning this. Thanks for sharing, Lydia! This is a great method! Accountability is so important. Often we can’t fight The Enemy alone. I believe Christian companions are one of God’s gifts to us to help us lead Christian lives a little easier! Good thoughts. There are definitely benefits to slowing down and lingering in passages over time. Found you from the Missional Women linkup, and I’m pinning to my Bible study resource board. Thanks! Some great ideas for your own personal Spiritual Journey. Thanks for sharing on #FridayFrivolity. I like your idea about picking a book that your preacher is going through a series on. Our pastor is preaching on Revelations, and I can certainly use help while studying that book 🙂 Thanks for sharing your post at Together on Tuesdays! Smiling over “hide all commentaries.” How did you know that my besetting sin is to “peek” when I really need to sit in the chair of unknowing for a while?